Somewhere over the past 12 months or so I’ve transformed from being a general sewer to being a quilter. Even though I make the occasional tote bag or skirt or Roman shade, when asked about my hobby, I call myself a quilter. I’ve been thinking about that phenomenon lately and wondering at what point the transformation happened. 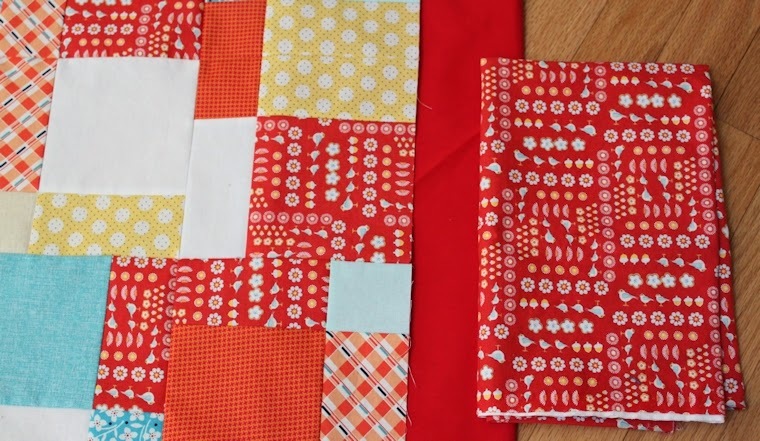 Did I become a full-fledged quilter when my stash grew to a particular size? (There was not much need for a sizable stash when I stuck to bags and home-dec projects.) I actually didn’t think my stash was that unwieldy until recently, when I found these jelly roll strips. When on earth did I purchase them? (Not being able to recall buying certain fabrics must signal that I have a big stash.) And why did I buy them? Because honestly, they’re really not me. Now that I’ve found them, they’re screaming to be included in the purge I’m working on right now. As if I needed another quilt project. Perhaps it’s the backlog of quilt tops that identifies me as a quilter. I’m currently in those halcyon days with these two quilt tops—fooling myself into thinking how far along I am with them. After all, the tops are completely pieced! But I still have to baste and quilt and bind these projects. Sigh. And this third one will continue to wait to be quilted. I have to learn how to free-motion quilt to finish it up. The quilt-top theory is one worth considering, but I know that other quilters have many more tops in the queue than I do. So maybe the first two stabs at deciphering this weren’t fully on the mark. I think I’m getting pretty close now! This is what signifies my “quilter-ness”: when a 40-yard bolt of batting is delivered to my front door. No, no! I’ve got it! It’s when a 40-yard bolt of batting is delivered to my front door and my husband is completely unfazed by it. Yes, I’m officially a quilter. How about you? 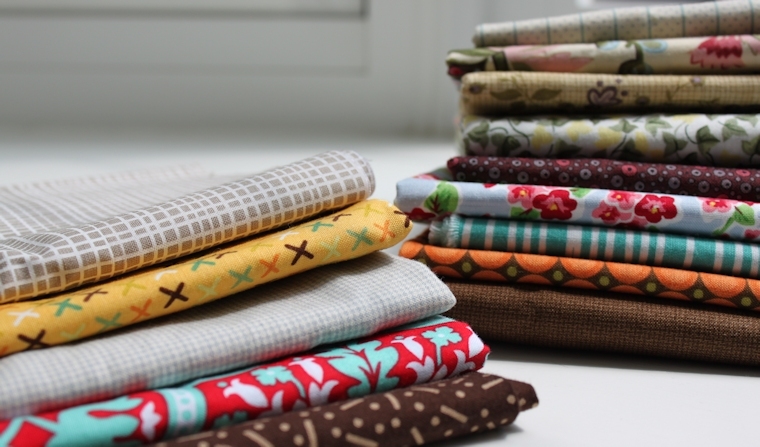 What is the dead giveaway that you’re a quilter? I bought a half-yard of this Michael Miller print for my Penny Sampler quilt last fall. But honestly, when I received it in the mail (it was an online purchase, made sight unseen), I knew it didn’t belong in my quilt. There isn’t anything subtle about it. The printed design is thick white lines that give the fabric a substantial, almost stiff, hand. Ick. I tucked it under prettier fabric in my stash and conveniently forgot about it until recently. In a moment of clarity, I realized I had been regarding this fabric only through the eyes of a quilter. I stopped thinking about what might make this fabric tolerable in a quilt and started to consider what other selections may suit it—and actually make it pretty. This is what I came up with: a print from Denyse Schmidt’s Chicopee line and Kona Tomato. Once I had selected the fabrics, choosing a pattern was easy. I went with s.o.t.a.k. 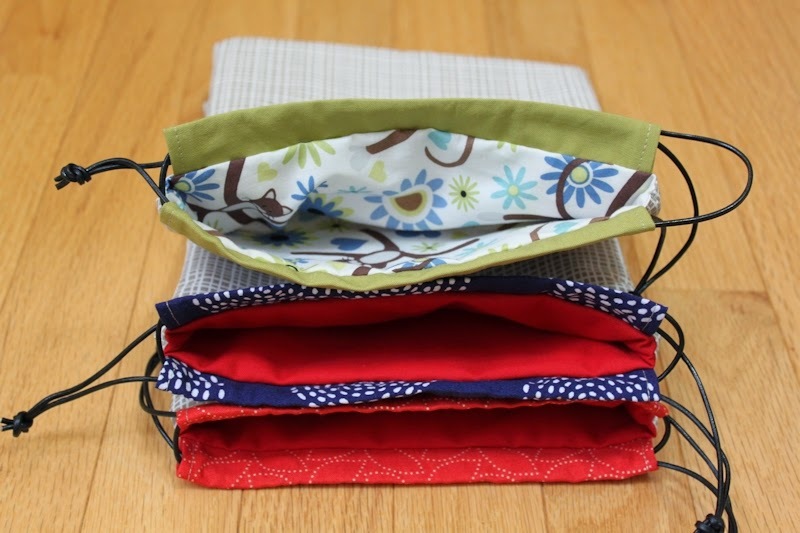 handmade’s drawstring pouch, something I had been meaning to try for a while. So I made one and liked it so much that I made another exactly like it. And then a version with Stitch Circle in navy. And then, clearly excited by bringing new life to this Michael Miller print and throwing all caution to the wind, a version with a chartreuse casing and kitty-cat lining. Wow, it was helpful to realize that I’m capable of pigeon-holing myself as a quilter. 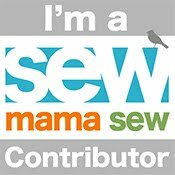 Actually, it was surprising: I’ve been sewing for well over a decade, but I’m just a one-year-old quilter. 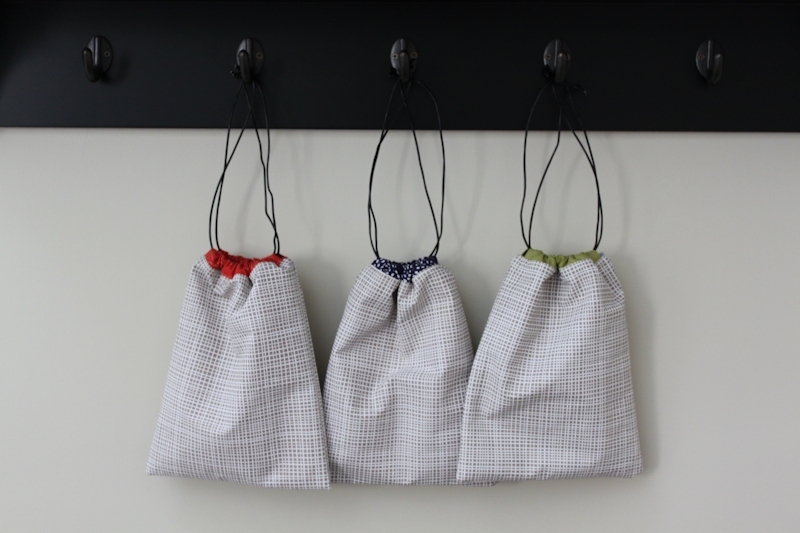 Do you have any recommendations on what to use as drawstrings for bags like these? 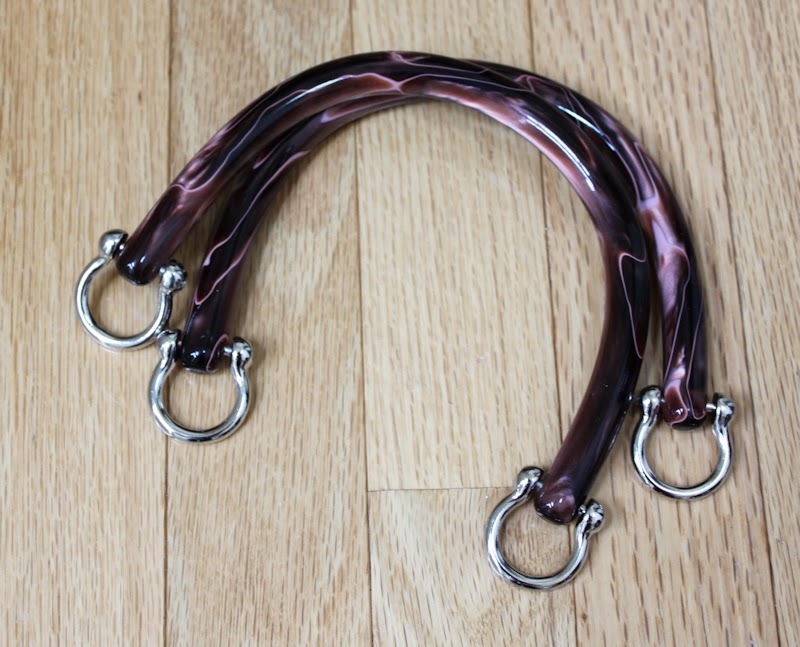 I used black leather cording for mine, but I’m not completely sold on it. In the past, I’ve used shoestrings for pouches for kids because they’re nice and durable. I like the look of ribbon until the pouch has been used a few times and the ribbon is no longer looking so great. Thanks in advance for your help! 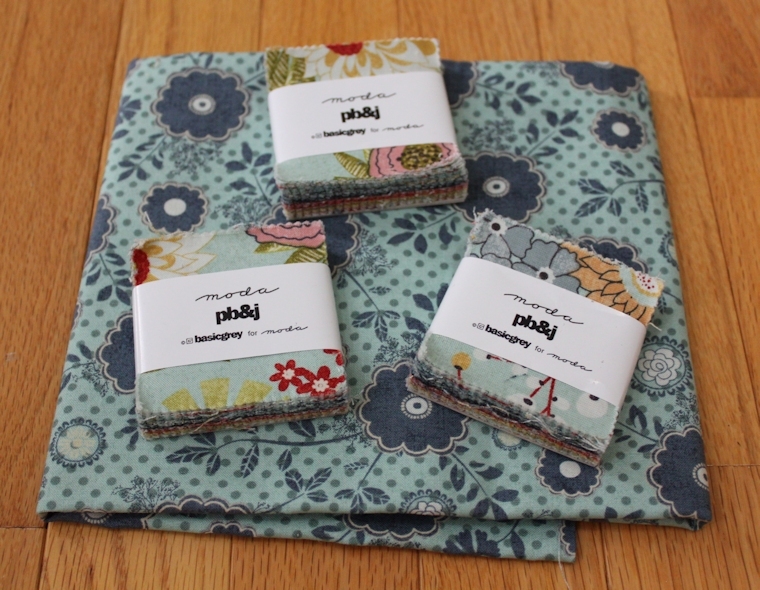 I’ve been enamored with Basic Grey’s PB&J line, for Moda, since its debut a year or two ago. So when I won a stack of PB&J mini-charms from my local quilt shop, I was pretty psyched and started plotting what I would do with them. During a visit to the Moda Bake Shop, I discovered Cheryl Brickey’s Candy Circle quilt. It was one thing to view selections from PB&J on the bolt or flipping through my little deck of mini-charms, but now having finished piecing my Candy Circle top, I have a whole new appreciation for the line. When I look at the color palette, I feel as if I’m viewing it through an Instagram filter: the geometrics and florals seem to have the slightest of sepia undertones. Gosh, it’s crazy pretty. There is a constant stream of amazing fabric lines being released. I have to let so many of them pass me by. After all, there’s only so much time in the day to sew, and I try to confine my stash to an oversized dresser drawer (and a big plastic bin and a few bags here and there). I’m glad I got to work with PB&J—in different media, at that!—before it disappears from store shelves. 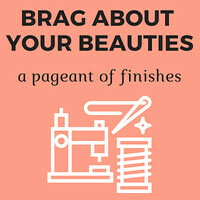 A word on our sponsor: A thank-you to the biggest sponsor of From Bolt to Beauty, my husband, who kindly took my older son on a 400-mile road trip, allowing me to get serious sewing and crafting done this week. I promise to rid Mantown of all craft paraphernalia before your return! I am happy to report that my version of Denyse Schmidt’s Big Zig is done. It has been pieced. It has been basted. It has been quilted and bound. I can only say: thank heavens! If you’ve been keeping tabs on my progress, you know that this Big Zig withered away in my closet for too many months, just hoping to be a real quilt one day. With my brother-in-law’s half-birthday looming (you read that right: this puppy was six months late), it was time to indulge in a little binge sewing and wrap things up. I’m so darn pleased with it. 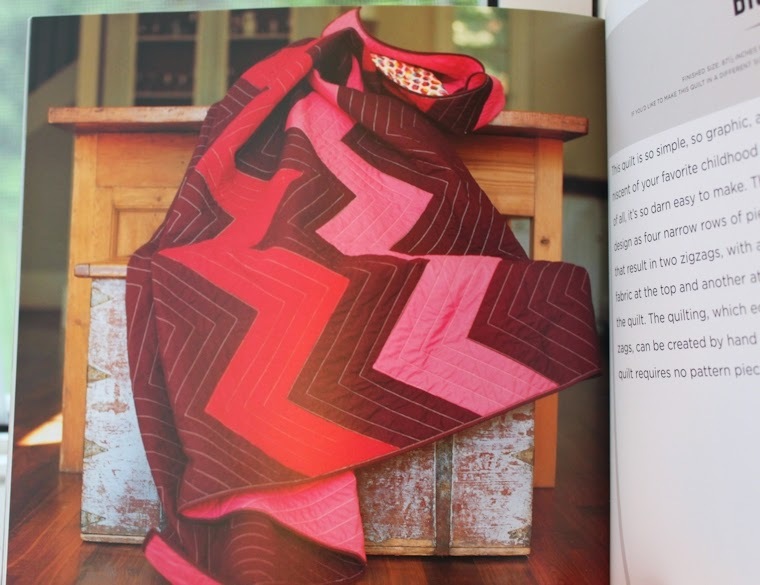 I thought that there would be little forgiveness in the chunky geometric chevron and the many zigs and zags that constitute the quilting. I was wrong. I began the piecing in 2013. Sure, it was a different year, but also, I was a different quilter. I’ve learned so much, and I suspect if I had done the piecing in one fell swoop (either then or now), the math would have worked out a little better. 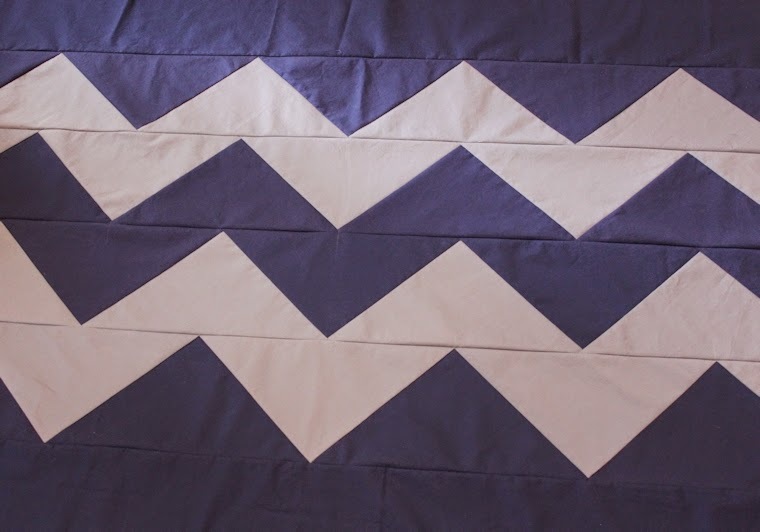 For example, I was drawing some guidelines through the crests and valleys of the chevron to mark quilting lines. Two zigs that were adjacent vertically were off by a quarter of an inch. 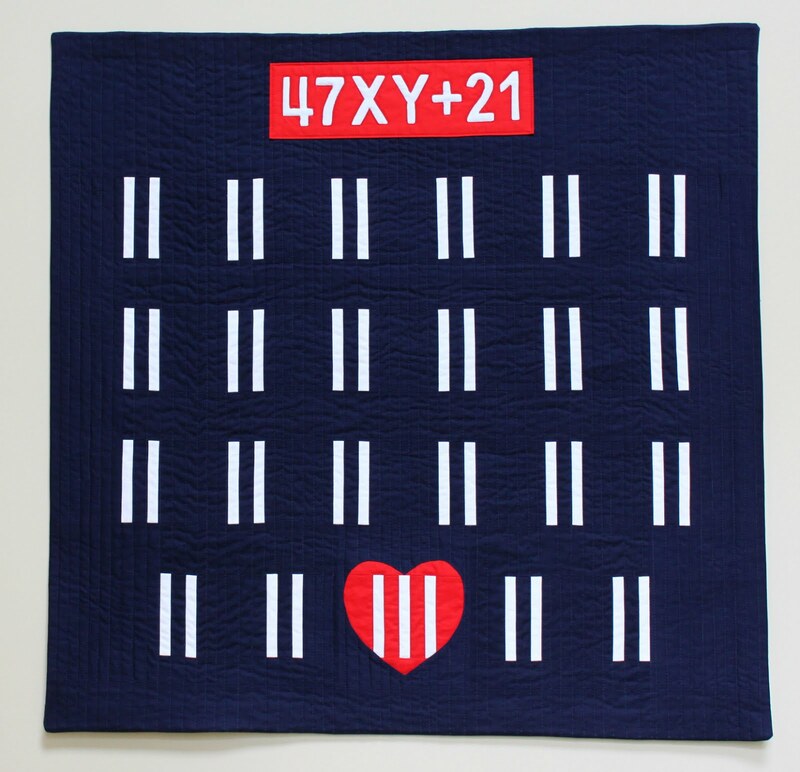 That is an order of magnitude to a quilter. For whatever reason—I can’t explain it and I’m trying not to overthink it—both the quilting and the project overall came out really well despite such inaccuracies. Then there was the happy accident of the back. I bought many yards of Carolyn Friedlander’s Botanics to make the back and then realized (duh!) it has a vertically oriented design and my calculations were based upon using it horizontally. (How many years and years do I have to sew before I stop making rookie mistakes?!) That, however, inspired the back my dear Big Zig now sports. 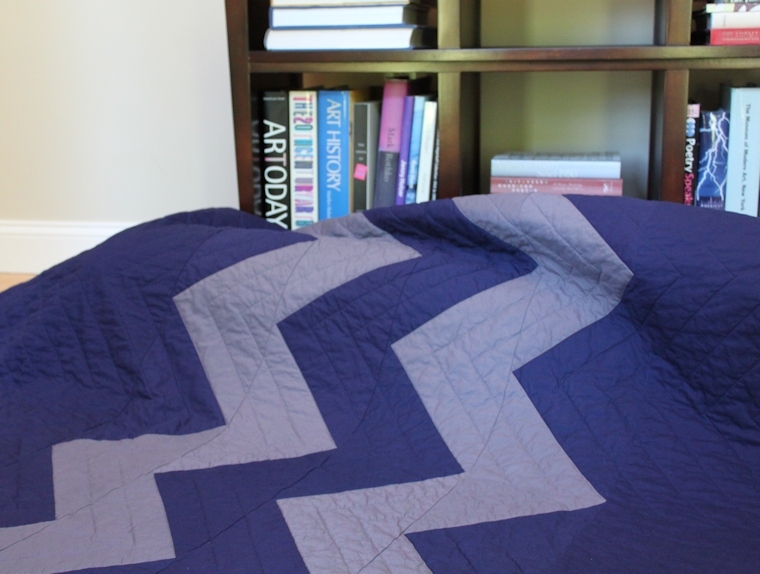 Like its brother, the quilt front, the back is geometric and chunky. 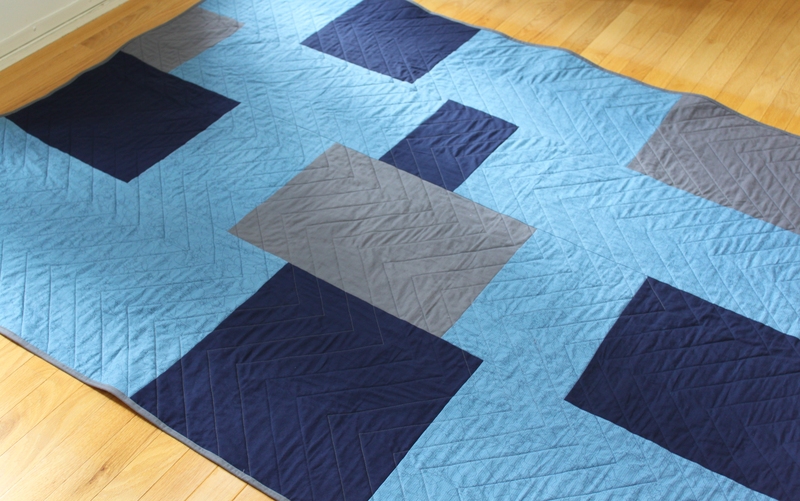 I quilted in thread that matches the front—some navy, some gray—which allows it to blend in nicely on that side. The back, on the other hand, shows peeks of the quilting here and there, hiding it in other spots. Super happy with it. 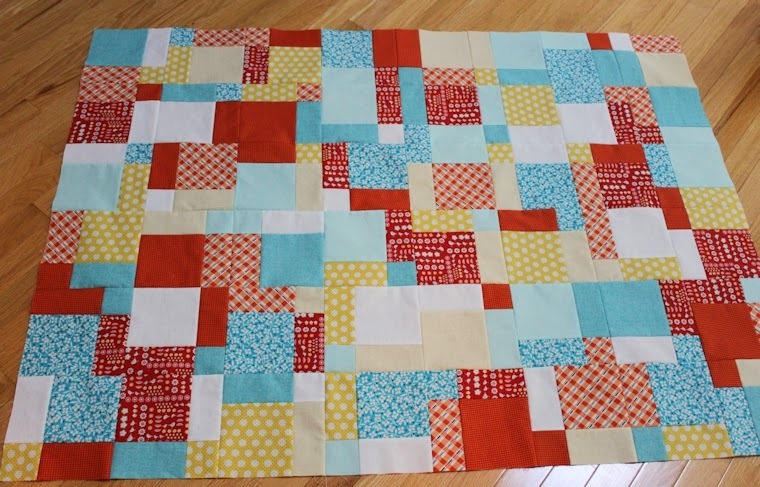 Linking up to My Quilt Infatuation and Finish It Up Friday! 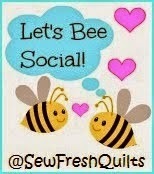 Update: I just joined in the fun at Blossom Heart Quilts! It happens to the best of us: we buy a fabric or 2 or 20, and then things change. Maybe our plan of attack for a project evolves and those fabrics don’t fit into our new vision. Perhaps we purchased some yardage online only to realize that, in person, it doesn’t work with our other selections. One way or another, we have some unloved and unused fabrics hiding in our stash. Rachel at Stitched in Color is looking to do something about this problem for herself and, in the process, help you and me purge these no longer enticing fabrics. Step one: identify what needs to go. 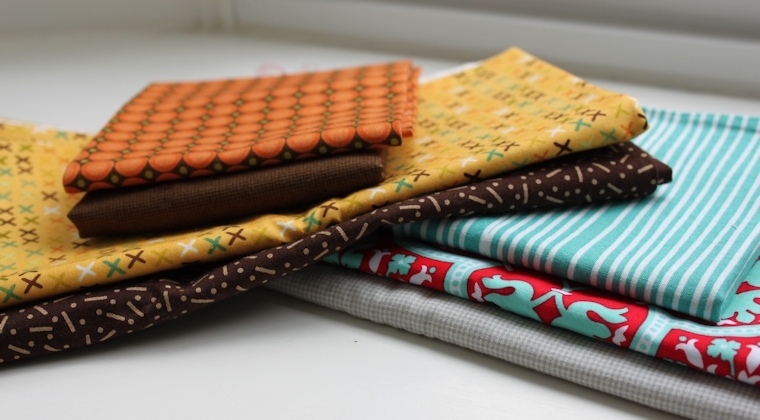 Although these fabrics were initially bought for different projects altogether, two colorways emerged: orange/brown/mustard and teal/tomato/gray. Go figure. I think I can make quilts out of both of these groupings without buying much, if any, additional fabric. Somehow, these unloved chunks of fabric have a promising future. I may actually be excited about using them. Starting with the teal/tomato/gray grouping, I looked through my scraps and solids. There are some Denyse Schmidt scraps from this quilt and some Kona tomato that I considered for this quilt. I also found that I own some selections from Tula Pink’s Prince Charming line. (Yes, this was news to me. I must have bought them in a pack of scraps.) 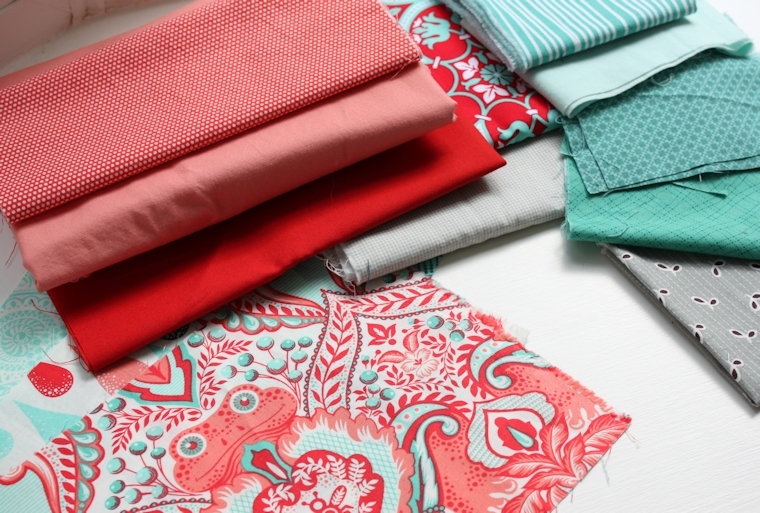 The Tula Pink designs are small snippets of fabric, just 7 inches by 8 inches, but I could incorporate them and expand the color palette here to teal/tomato/gray/salmon. I have a bunch of Kona salmon and Bonnie and Camille’s Happy-Go-Lucky in salmon left over from my Farmer’s Market quilt. I was recently over at 13 Spools, joining in the conversation about works in progress. How many should a sewer have going at once? Is every idea one worth pursuing? It’s necessary for me to have more than one ball in the air at a time. I need the variety for those moments when I get bored with a project. Sometimes, I need a quick finish (and let’s face it: quilts are never quick finishes!) so that I can revel in that sense of accomplishment and propel myself into a more daunting project. Then there are those times I consider taking a pair of shears to an especially frustrating project (haven’t done it … yet!). In those moments, I slowly back away from my sewing table and move on to something else. But it’s possible to let something wither away undone for too long. Case in point: my version of Denyse Schmidt’s Big Zig quilt. Originally, I was working with a December 2013 deadline (for a Christmas present). Then it was a January 2014 deadline (for the same person, but for his birthday instead of Christmas). Now I’m going for the recipient’s half-birthday, in July. Yes, I am ridiculous. But half-birthdays should be real things—like, with cake and presents. My original stab at this quilt was delayed by my Penny Sampler, although I can honestly say that life in general was delayed by my Penny Sampler. The Penny Sampler has been done since January, so what’s the holdup? 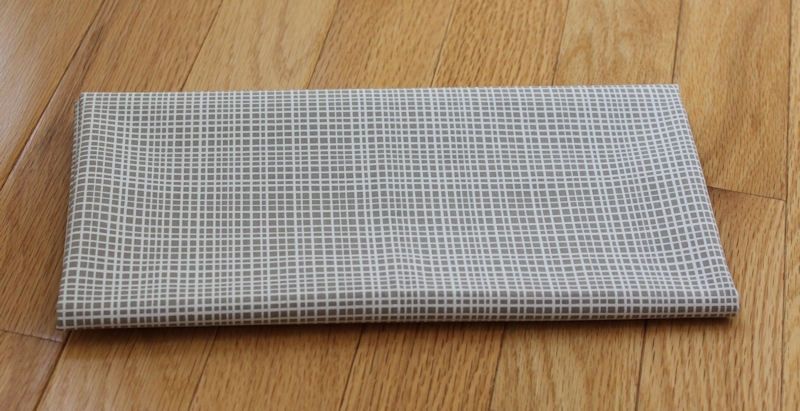 The Big Zig is super easy to piece, and I’ve had the fabric. I think it’s the quilting. I’m drawn to the simple geometry in some quilts. But there’s little forgiveness in the quilting here—especially in the way that Denyse quilted the original, with a contrasting thread! I will be choosing a more matchy-match color of thread, which should somewhat hide whatever flaws appear in my final quilt. So I’ve assessed the situation and confirmed that what I have cut I can use. I wish I had written some notes about where I was in the process when I set it aside. (Truth be told, I didn’t think it would be ignored for half a year.) For example, one cut triangle had a pin in it. I’m sure that was meant to indicate something. It’s like a secret message from my fall 2013 self to my summer 2014 self. Too bad I can’t figure out what it is! What’s your take on WIPs, Goldilocks? How many are just right? And on another subject: how do you feel about quilting for dudes? This is my first quilt specifically for a guy (the rainbow quilt for my five-year-old son doesn’t count). What have you made for the men in your lives? I ask because I plan on embarking on another guy project. Thanks in advance! Linking up to . 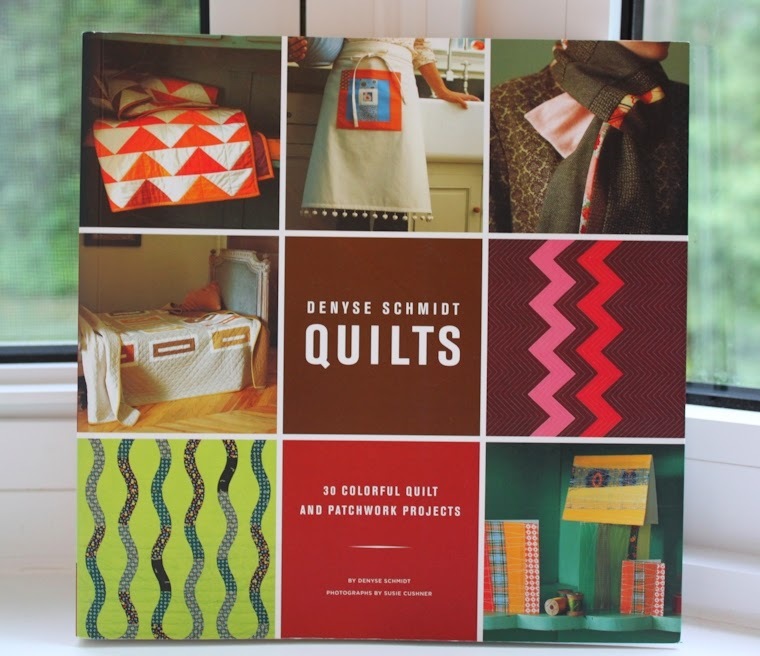 . .
I’m doing my take on Denyse Schmidt’s Big Zig quilt, from Denyse Schmidt Quilts: 30 Colorful Quilt and Patchwork Projects. I have the front pieced in Kona Coal and Kona Nautical. The back incorporates those two solids with one of Carolyn Friedlander’s Botanics fabrics (any excuse to use something from that fantastic line!). The original deadline for the Big Zig was December 2013. Not only am I committed to finishing it by the end of this quarter, but—heaven help me!—if I don’t have it complete by this upcoming weekend, I think my brain is going to spontaneously implode. How’s that for motivation? Update: This quilt is finished—and my brain didn’t spontaneously implode! Check out the WIP here and the final quilt here. I had the pleasure of winning some mini-charm packs from my local quilt shop. (Man, I love guilt-free fabric acquisition.) I’ve been meaning to transform them into Cheryl Brickey’s Candy Circle quilt. Those mini-charms look sweet and innocent, but if you were with me right now, you would hear them mocking me, “Nope, nope—another three months will go by, and we won’t be a quilt!” Little punks. I’ll show them. Update: I sewed these mini-charms into submission. Check out the quilt as a WIP here and a finished project here. A friend’s birthday is coming up, and I think she’d like a tote bag. I’ve been on a roll with a tote pattern from Noodlehead. 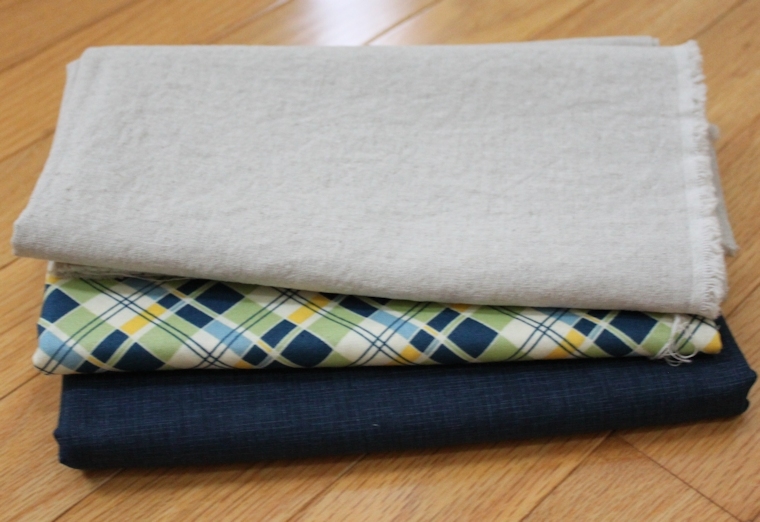 I think I’ll use these fabrics—Essex Linen in flax, Quilter’s Linen in navy, and a plaid from DS Quilts—to work it up in a flash. Ha! Like anything around here happens in a flash. Update: Done, done, done! See the finished tote right here. Two friends and I recently started a quilt-along. We’re each doing our own versions of disappearing nine-patches. It’s been crazy fun, but we’ve been taking it slowly on purpose. This is supposed to be fun, stress-free sewing, especially for my friends—this is their first quilting experience! While I want to maintain a leisurely pace for this summer project, if these quilts aren’t done by the end of this quarter, I’ll start to go a little batty. Update: I finished this and just barely made the closing of the finish-along linky party! Check out this project as a WIP here and here and as a finished quilt here. What do you think? Can I do them all by the third-quarter deadline? I guess we’ll see. Woo hoo! I completed all four projects! Check out everyone else’s goals at the Littlest Thistle. It was about a year ago that I embarked on my first quilt. 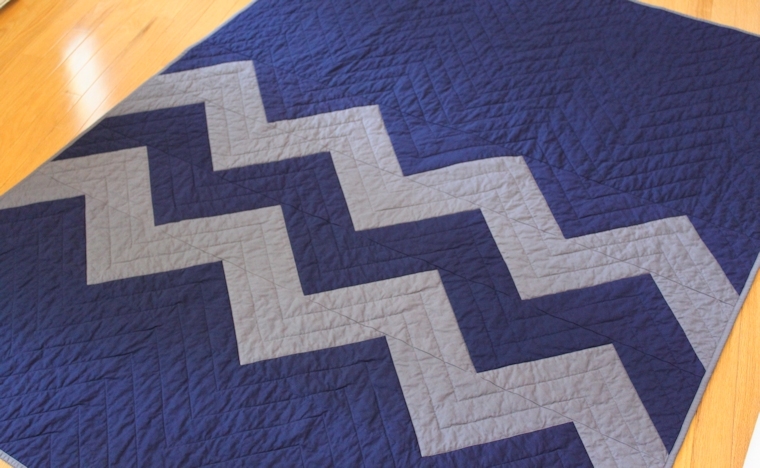 This project was a humble affair—just 8-inch blocks sewn together, quilted with a cross-hatch, and finished off with a zigzag binding. My agenda was clear: decide whether I liked jamming all of that fabric through my sewing machine enough to do it again. 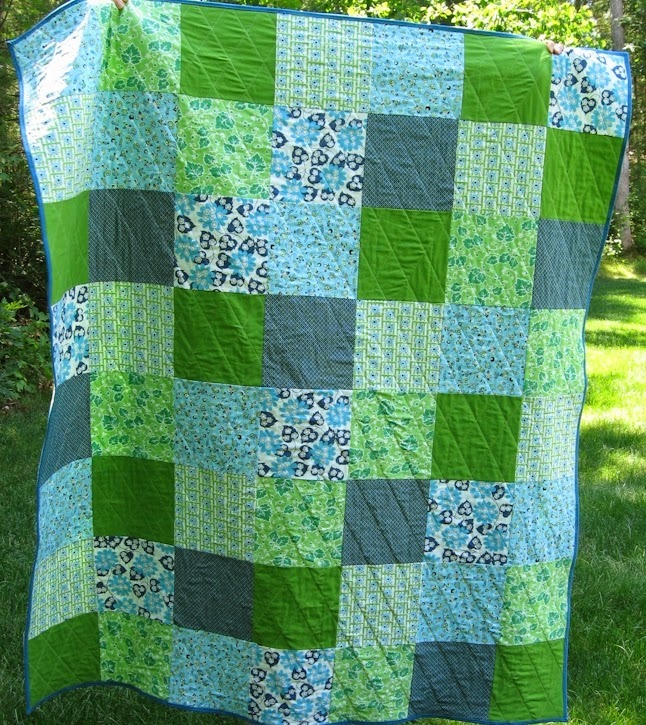 I wasn’t sure about giving quilt #1 away (did I mention it was humble? ), but I did, to the perfect recipient. My friend was not expecting a birthday gift from me last summer, and she was touched that I took the time to make her something. 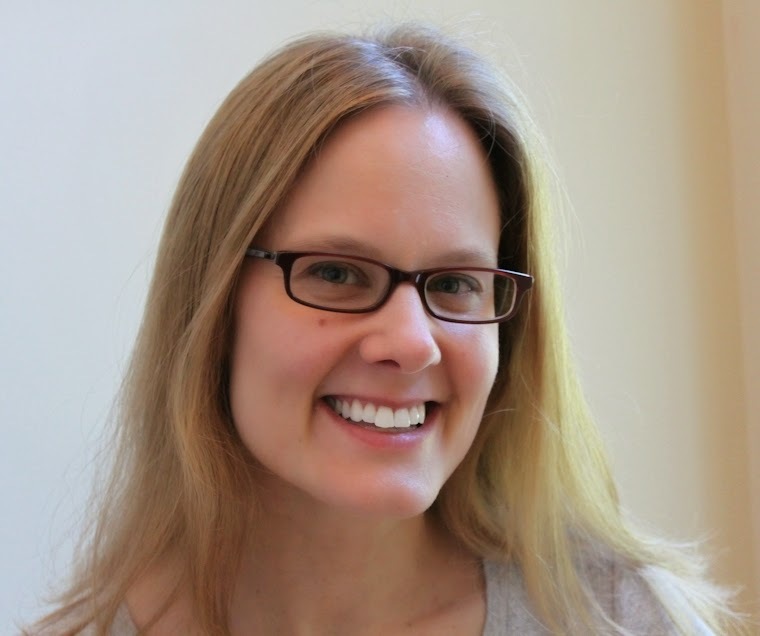 I saw her everywhere around town last summer, quilt in tow—at the farmer’s market, at the playground. She bragged about me and the quilt to just about everyone she encountered. She made me feel like a million bucks, and I couldn’t resist sewing her a special something for her most recent birthday. Quilt #2 followed, my version of Liesl Gibson’s Travel Quilt, from Little Things to Sew. It seemed impractical to make for a baby girl (perhaps a stain-hiding puke green or poop brown would have been more apropos?). But I wanted to see if I could make it, and I could. It’s fun to look back over the past year and the projects that took root in my imagination and now are quilts that are used and loved and snuggled under and picnicked upon. I’ve gotten to know my machine better, including its strengths and frustrating weaknesses. I’ve become more confident in fabric selection and sewing accurate seams. And somewhere along the journey, I’ve transformed from being a sewer to being a quilter. Imagine that. 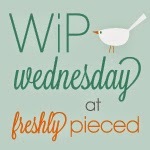 I’m linking up this post to Finish It Up Friday and TGIFF! Apparently, on federal holidays marked by thunder, lightning, and sudden downpours, I choose to go fabric shopping. Of course, on perfectly beautiful days with clear skies, I am also known to—ahem—go fabric shopping. On Wednesday, Rachel at Stitched in Color put out a challenge: using the fabrics at Fabric Spot, an online Canadian retailer, curate a 12-piece collection of fabric that’s “unabashedly yellow.” Rachel, I am so on it! As a New Englander, I have a healthy distrust of color. When you see brilliant colors in the natural world only from May through October, it’s hard to embrace bright, bold colors. And that’s the beauty of yellow: it’s an honorary neutral. In fact, my dining room, living room, half-bath, and guest room all have a shade of—you guessed it—yellow on their walls. 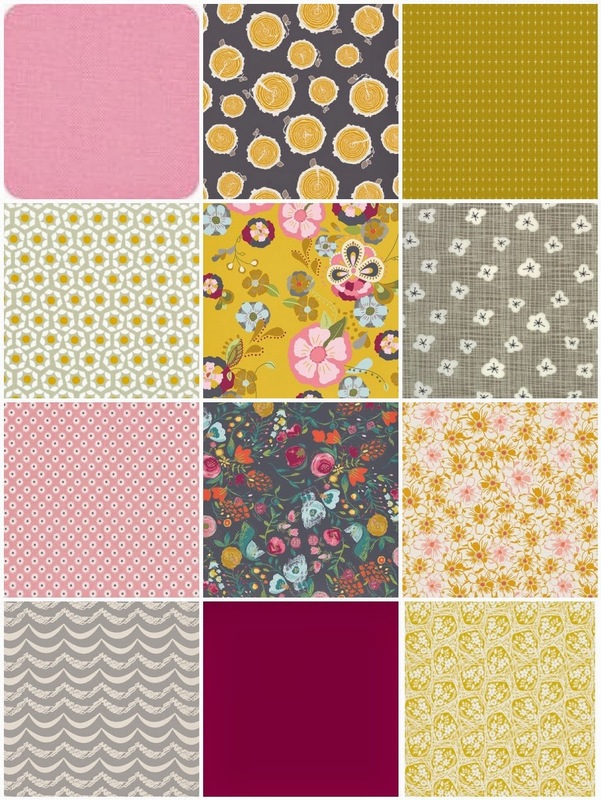 I started my collection with the two Emmy Grace fabrics in the middle, a floral with a mustardy yellow background and a floral with a dark gray background. Yellow and gray are such a modern combination. I chose to mix things up by pulling out the pink and fuchsia in those two original selections. A few weeks ago, I invited two friends who had never quilted to join me in a disappearing nine-patch quilt-along. It’s been great fun, and my plan has been to stay just a few steps ahead of them. That way, I always have something to use for demonstration purposes. We cater to visual learners here at the Michelle School of Quilting. The problem is, I’m having way too much fun. 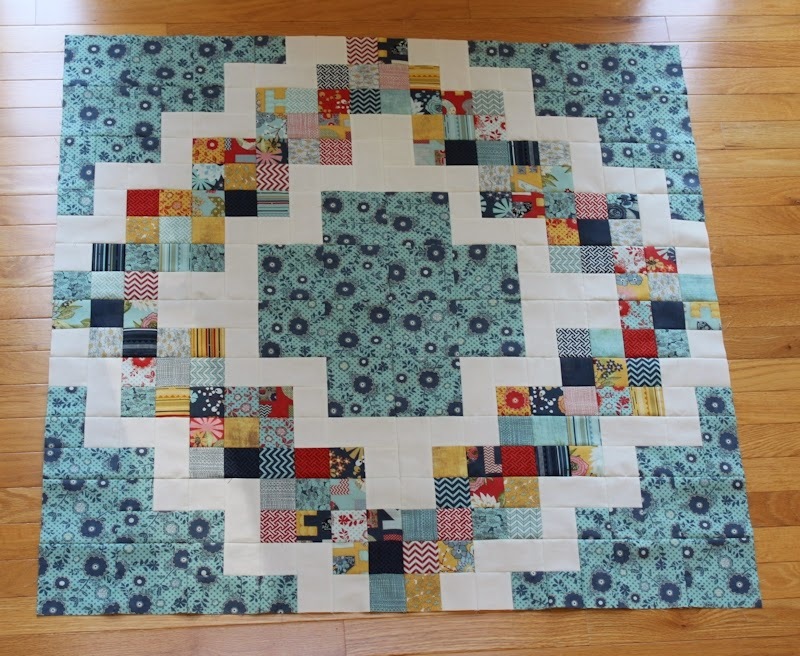 I found myself on a roll and couldn’t stop myself … until I had six of the eight rows all pieced. I pinky-swear, Miss L and Miss C, not to do any more work for the time being. But I’ll be doing some thinking. Like, should I add a tomato-red border or not? I consider this to be a red quilt—which is preposterous because a mere two-ninths of it is red. 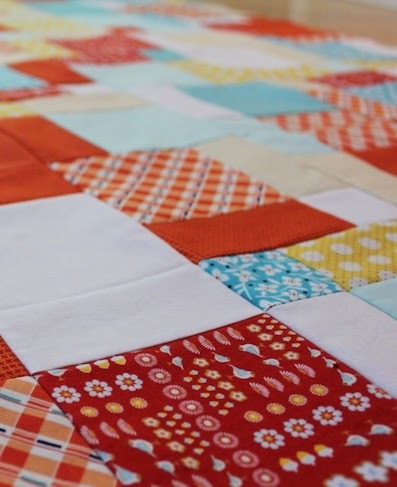 But it’s the red fabric with the endearing blue birds that started this quilt and grew it into the collection of red, orange, teal, yellow, and white it is now. The Kona Tomato I picked out, however, doesn’t quite match the red in Lauren and Jessi Jung’s Hideaway. (The picture doesn’t capture the difference particularly well. 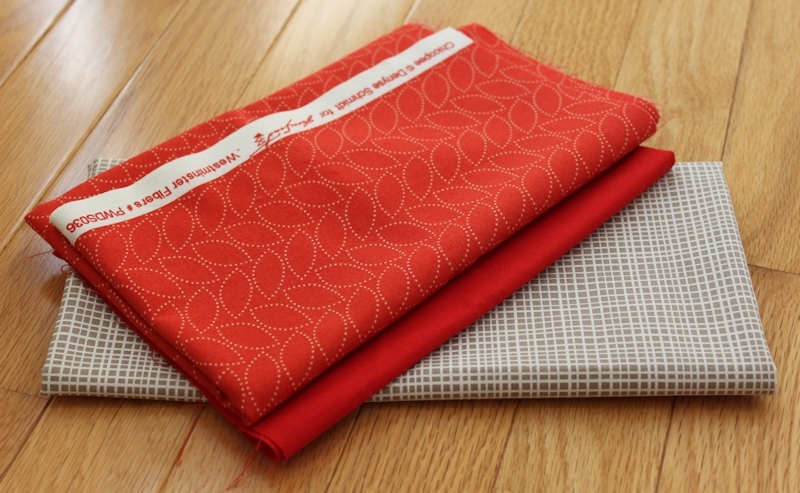 The Kona fabric is a brighter red.) What do you think? 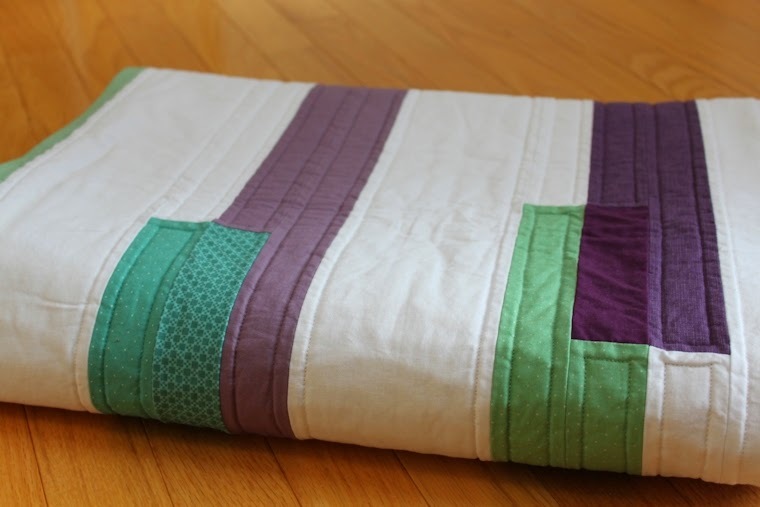 Can this quilt stand without a border? One way or another, I’d like the binding to be on the dark side, something that grounds the quilt. Maybe the Kona Tomato could work there, despite the color discrepancy with some of the blocks? Or should I use the sweet birds as binding? Help!